Hello! 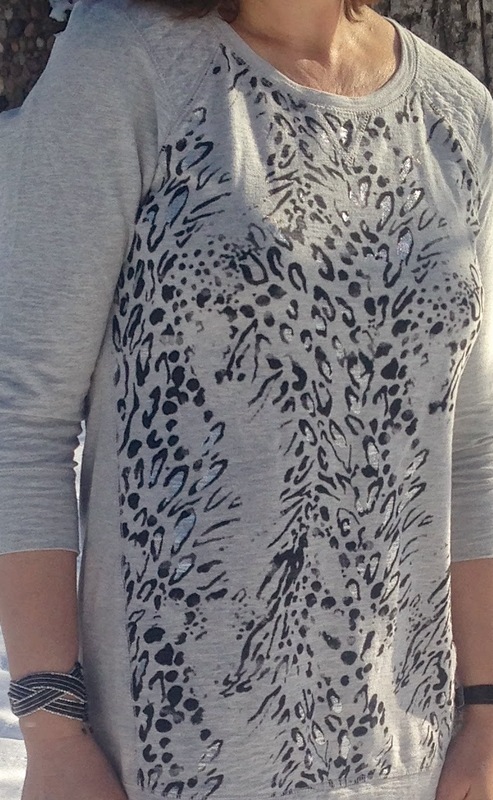 For this week's Fashion Over Fifty post I'm back with more animal prints. But first, I have a confession to make. The top I'm wearing was suppose to be a possible Christmas gift to my daughter. Sorry if you really like it Ashley. You can borrow it if you want. I told all my kids I wanted to cut back on holiday shopping this year because I want to quit my very stressful job, and to therefore limit the dollar amount spent to only $100.00 per child and to give me their Christmas wish list based on that. So Ashley told me she wanted a pair of Cognac boots, well, those alone almost cost her entire budget, so I could only get her one more small item to stick to my budget. 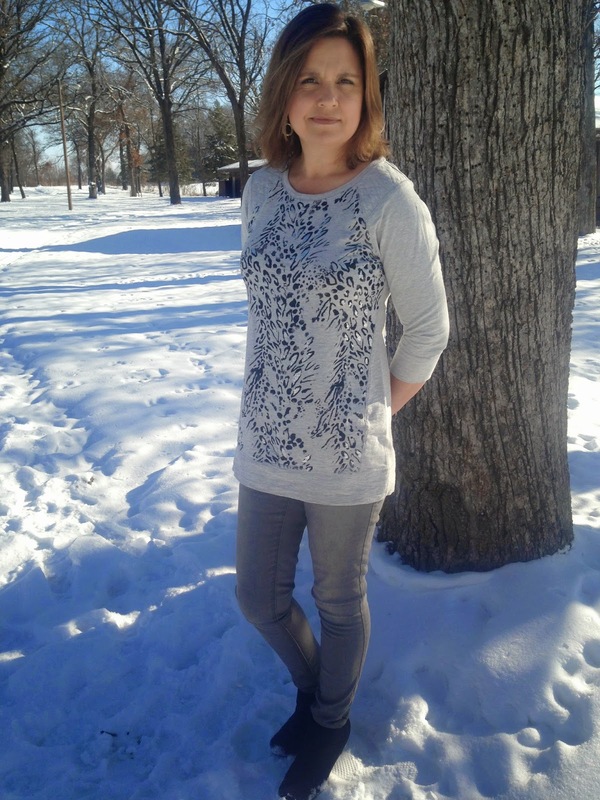 I was shopping at Macy's for my winter coat and I spotted this animal print sweatshirt (sorry, I couldn't find an on-line link), and a couple of other items. I wasn't sure which of the three items Ashley would like the best, so I just bought all three thinking I'll give her a choice which one she wants the most, and I'll either keep or return the other two items. Well, the other day when I was trying to get dressed for the day, I must have tried EVERYTHING on in my closet, and couldn't seem to find anything I liked or that looked good on me: you know those days, when you have a closet full of clothes, and you still can't find ANYTHING to wear? And then I saw it. The cute animal print sweatshirt. 'Boy, that's cute. I'd love to wear that! No, I have to save that one. Oh, but it's soooooo cute! Maybe I should just try it on and see what it looks like?' So I gave in to temptation and tried it on. It was love at first sight. It was so warm, and comfy, and oh…..I loved the length and how slimming it was. I usually don't like sweatshirts cause they are too thick and they stop at your waist line and therefore make you look fat because you have all this extra material bunching up at your tummy. But the material of this sweatshirt is thinner, and I loved the quilted detail in the shoulders and the sparkle in the animal print. It was perfect. So I wore it. But I felt guilty. Oh well, there are still two unused items hanging in my closet. Now I just need to keep my hands off those or I will be going shopping again. Even though animal prints are timeless and never really go out of fashion, they have been especially on trend the past two seasons and I own many animal print items already: a leopard clutch, two leopard scarves, leopard and snakeskin flats, and a couple of leopard shirts. 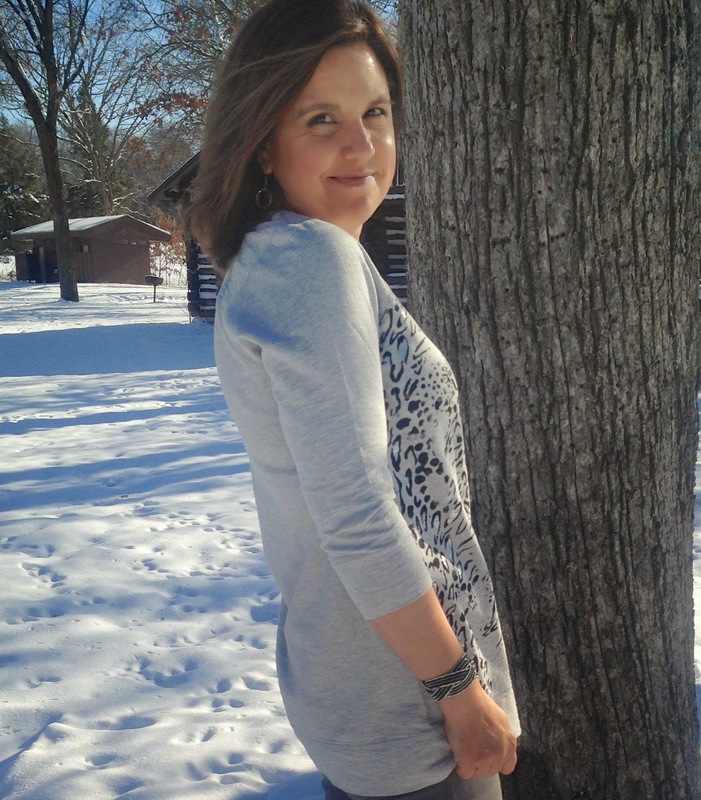 For someone over fifty, wearing animal prints can be tricky because they do age you. 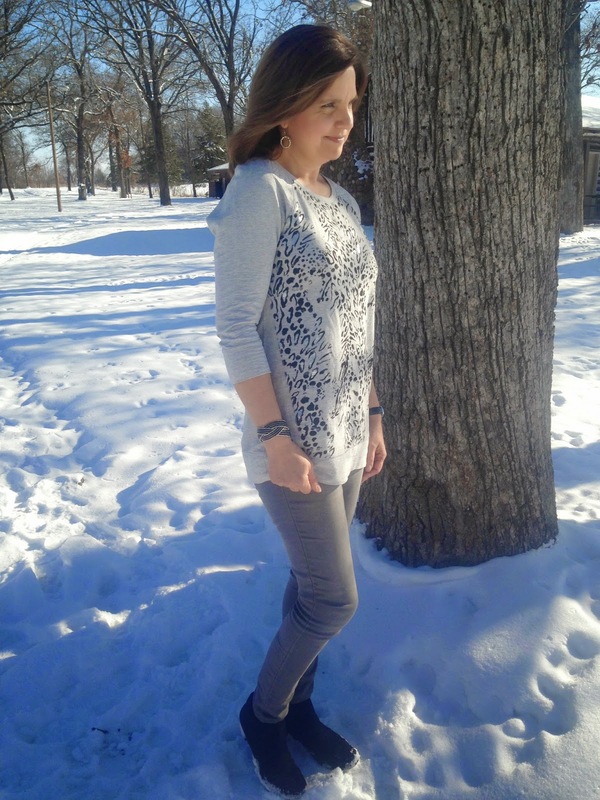 Older women are notoriously known for wearing animal prints, and I didn't want to look older than I already am, so I've always used animal prints in small doses: like accessories or shoes because of that. Another way to keep from dating yourself when wearing animal prints is to wear it in a more trendy way, like this sweatshirt. It is fresh, and young looking because of the cut and the material. Because there is so much detail and sparkle in the sweatshirt, I kept my jewelry minimal by wearing a black and silver sparkly bracelet, a black and silver watch, and simple silver drop earrings. The grey skinny jeans that I'm wearing I picked up at Target at the end of the season for only $3.99. The score of the year! They are one of my favorite pairs of jeans that I own. They are so soft and comfy, and fit like a glove. For shoes I wore black suede booties. Because I got some inquiries on my new winter coat that I showed last week, I decided to include some more pictures of it this week too. This time, I closed the zipper! I bought my coat at Macy's, it does not appear to be available on-line. The inside of the label says Laundry by Shelli Segal if you want to try searching for it on-line at another store other than Macy's. The coat has a beautiful, lush fur trim that extends all the way down the inside of the coat. It zips and snaps shut and it also has a tie at the waist to give the appearance of a waist line when your wearing a big puffy coat! I love the over sized, fur trim hood. I don't like hats because they ruin my hairdo and cause static electricity, but on very cold days, when I have to cover my head, a great hood like this does the trick. So how do you like all our snow? Great, isn't it? NOT! It is has been miserably bitter cold here in Northern Wisconsin for a couple of weeks now. Today, it's only in the single digits. Unbelievable. It's not even Thanksgiving yet, and the temperatures were experiencing are more like what we see in January or February. It's so sad. Pity party here. Taking pictures in these cold temperatures has been anything but fun. I'm thinking if this continues, I might have to set up a photography studio in my house because it isn't fun being outside without a coat on in this weather! To those of you who live in warmer states, count your blessings! I wish I were you! I love that shirt Amy! It looks fantastic on you! And thanks for your help with the coat. I wasn't able to find it in town, and I wasn't able to go to Macy's yet. Good luck with your job decision. I quit my very busy pharmacy job last month (I only worked part time), and I haven't regretted it, although sometimes I miss it but only for a few thoughts. Ohlove sweats with animal print, i have many things with cats héhé !